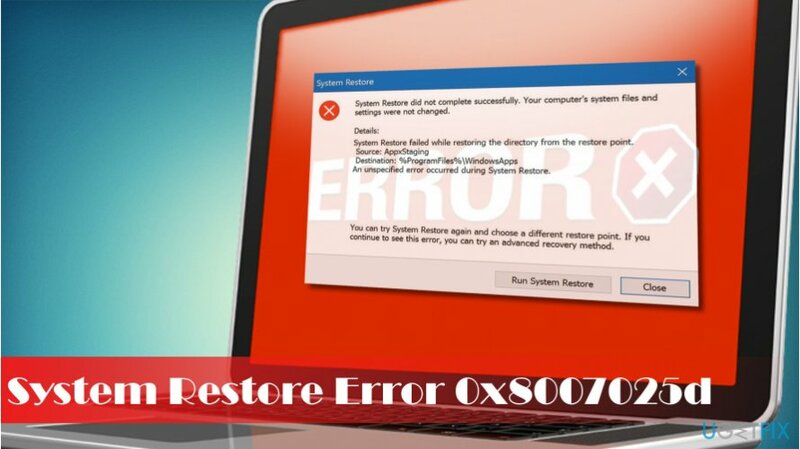 Home »	Fix » How to Fix System Restore Error Code 0x8007025d on Windows 10? 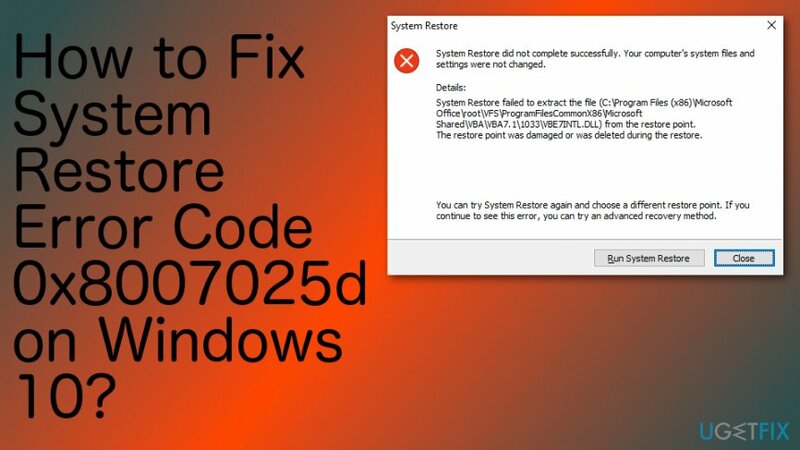 Issue: How to Fix System Restore Error Code 0x8007025d on Windows 10? System Restore fails with an error “System restore failed to extract the original copy of the directory from the restore point. Source %Program Files%WindowsApps.” I’ve no idea what does that mean or what should I do, so any help would be highly appreciated. Few people have reported a fatal Windows 10 Restore Point error 0x8007025d. It emerges when a PC’s owner attempts to perform a System Restore by enabling a point created earlier. For this purpose, he or she navigates to the System Properties -> System Restore and then enables the latest (not necessarily) Restore Point. System Restore is not a new feature as it has first been introduced in Windows ME. 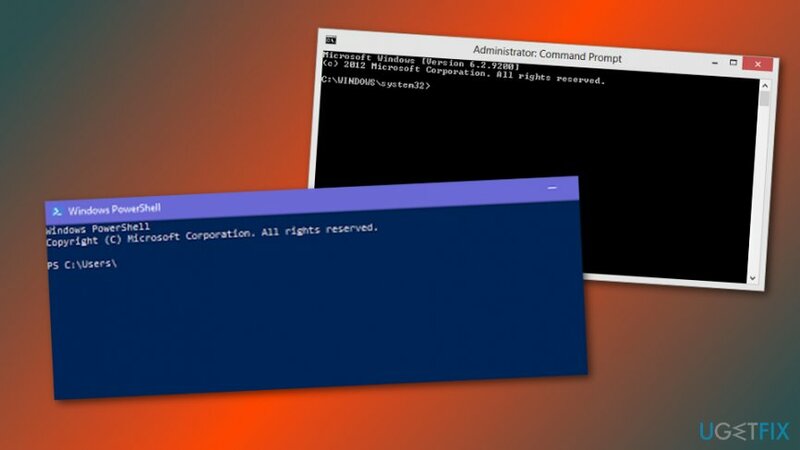 In Windows 10 the creation of Restore Points is turned off by default, but all users can create them manually by performing several simple stems. 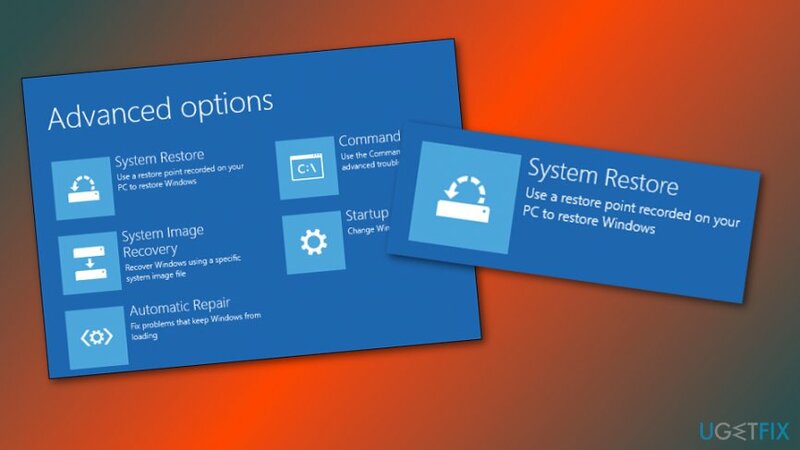 In case of some serious Windows failure, the Restore Point created before the occurrence of the issues allows people to get back to the previous Windows state regarding system files, settings, registry entries, etc., except personal files. Therefore, System Restore errors like 0x8007025d are a great badge. It seems that the culprit of the bug is the AppxStaging and broken files located in the %Program Files%WindowsApps directory. Several people reported that when trying to grasp the trigger they have managed to find the c:\\Program Files\\WindowsApps folder, but no APPxStaging can be found. Some experts claim that the problem may stem from faulty Windows 10 updates released in February. Therefore, the first thing to try to fix System Restore error 0x8007025d is to install Windows 10 Creators Update. If the problem is happening on the on the Creators Update, the solution would be to enable System Restore at boot, clean WindowsApps folder or enlist the content of the %ProgramFiles%\\WindowsApps folder. Press Shift key repeatedly during the boot phase and select Repair your computer. Now select Troubleshoot and click Advanced options. Click on the System Restore option. Right-click on the %ProgramFiles%\\WindowsApps folder and select Properties. Open Security tab and find the group or user name section. Select Advanced button and check the Owner section at the top of the Advanced Security Settings window. Select Change and then click Advanced on the User or Group window. Enter the name of your User Account and click Check Names (you can do the same by clicking on Find Now button). Select your account from the list and click OK. Check the Replace owner on subcontainers and objects and click OK to save the changes. Once you assign the %ProgramFiles%\\WindowsApps folder's ownership to yourself, rename it to WindowsApps Old. If a UAC opens, click Yes to confirm. Type PowerShell and press Enter. In the PowerShell window, look for the C:\\WINDOWS\\system32 path. If the path is present, type cd $env:programfiles\\WindowsApps command and press Enter to change the path of the WindowsApps folder. 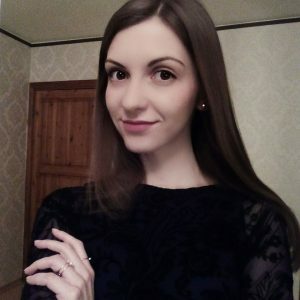 Now type (LS -Re -Fi * -Fo -Ea:Inquire).FullName | clip and press Enter to enlist all sub-folders and its content via PowerShell. Copy the results and store them within the clipboard. Finally, type notepad in the PowerShell window and click Ctrl + V.
Hopefully, these steps helped you to fix 0x8007025d error and regenerate System Restore functionality. After all, we would recommend scanning the system with Reimage optimization utility to delete temporary files, outdated system files, damaged registry keys and other garbage that may negatively influence PC's performance. ^ Windows ME. Wikipedia. The free encyclopedia. ^ Margaret Rouse. Registry key. What is. Tech target. ^ Aatif Sulleyman. WINDOWS 10 CREATORS UPDATE: WHAT YOU NEED TO KNOW AND DO BEFORE DOWNLOADING IT. Independent.co.uk. News website.